The Graduate Certificate in Cognitive Science requires a minimum of 12 credits, consisting of one required core course and three electives. Students interested in obtaining the certificate will design an individualized plan of study in consultation with their major advisors, and the Certificate advisor (Program Director). The plan of study will be submitted to the Cognitive Science Steering Committee, which will advise on the appropriateness of the selected courses for the student's stated goals, the availability of such courses, and the preparation necessary to undertake them. 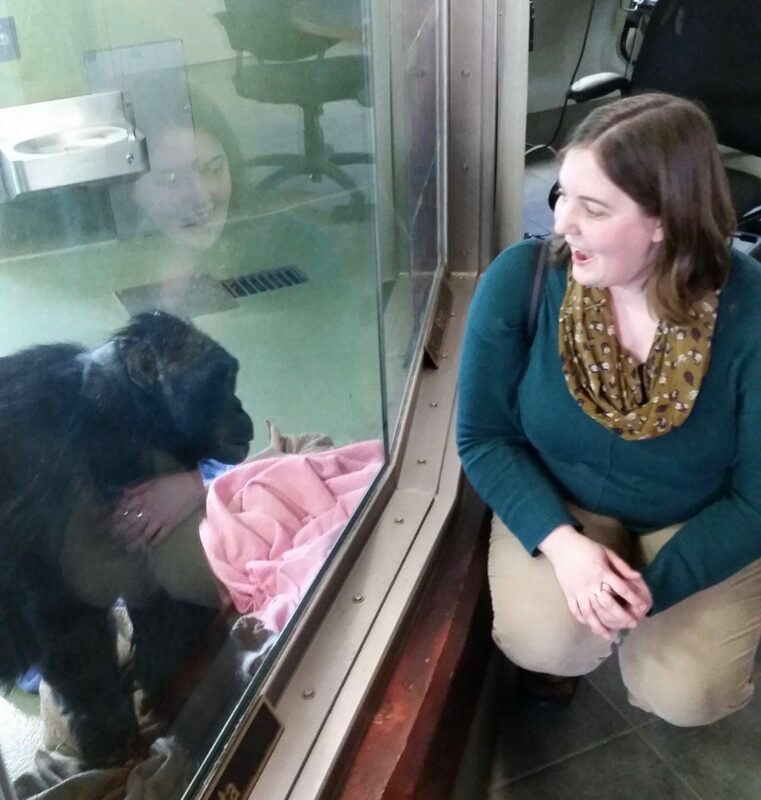 Emma Kelty-Stephen, an alum from UConn's Cognitive Science Graduate Certificate Program, is pictured with Kanzi the bonobo chimp who acquired some understanding of English. Emma is now a Professor at Grinnell College. Three courses from the list below, including courses from at least two academic departments or divisions. Students are encouraged to have at least two courses from outside their home department/division. (NOTE: None of the courses below are offered by the Cognitive Science Program. For further information about a course or permission to enroll, please contact the offering department.) Students who are candidates for both the Cog Sci Grad Certificate and the IGERT program may use at most one IGERT course to satisfy the Cog Sci Grad Certificate requirements.